The overall objective of the GOTO Astronomy Lab project was to design and construct a state-of-the-art astronomical laboratory for use with our two-semester introductory astronomy course sequence. 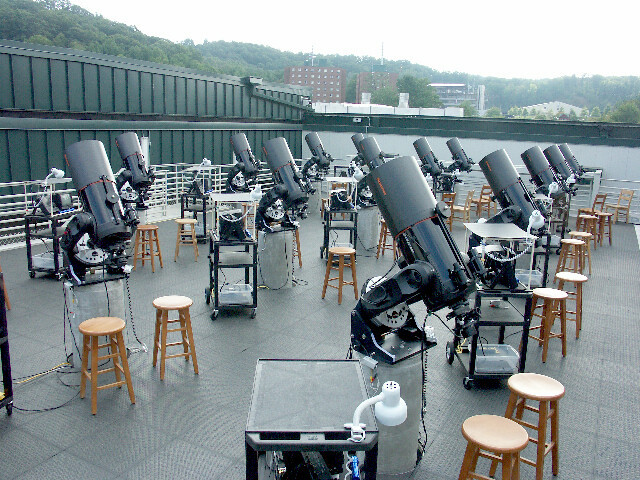 The intention was to create a facility that provided the students with the opportunity to make visual, CCD imaging and spectroscopic observations either directly from the observing deck or from an adjacent laboratory room. In addition it was desired to create the capability to do scientific analysis on these observations in much the same way that research astronomers do. In addition to the facility’s use as a university laboratory, it was planned that it would also provide an ideal environment for public and K-12 tours and observing programs, teacher workshops and summer astronomy camps. The overriding themes in terms of the functioning of the physical structure of the laboratory as well as the choice and operation of the telescopes and ancillary equipment were simplicity, shallow learning curves, reliability and performance. These concepts intended to make the laboratory experience rewarding and enjoyable for the students. A construction bond issue allowed the replacement of the old Rankin Science Building which housed our previous observing deck and lab room. This provided the opportunity to design the facility from scratch rather than trying to retrofit it to an existing structure. The resulting observing deck in the closed and open configurations is seen below. The 40'x60' observing area has 18 concrete telescope piers which are vibrationally isolated from the deck structure that surrounds them. The deck is covered with interlocking heavy industrial grade ergonomic rubber matting which is designed to reduce fatigue induced by long periods of standing. In addition it provides secure footing and a forgiving surface for items that might be dropped on it. The raised deck is surround by a railing and is accessible by steps from both the front and back. There is also an elevator to provide handicapped access to the observing deck. The deck has been provided with both white fluorescent lighting and red LED foot lighting fixtures. The heart of the physical facilities is the roll-back roof system. Without it the rest of the facility would not have been possible in a form that met the design objectives. The Celestron CPC-1100 telescopes are far to heavy to be set up and taken each night. Our previous facility required the set up and take down of 12 Celestron-8 telescopes which was a time consuming and arduous task which took its tole on the optical alignment and mechanical structure of the telescopes not to mention on the lab instructors and assistants. The rollback roof was designed by the engineers at Piedmont Hoist and Crane. It is computer controlled, using optical encoders to assure even motion of the roof as well as sensors to detect any obstructions and shut down if one is encountered. It can be fully opened or closed in approximately 2.5 minutes. It is equipped with heaters to remove ice and snow build-up on the rails on which it moves. The roof provides the obvious weatherproof environment need for the permanently mounted telescopes as well as the associated equipment. However it also provides the ability to make use of potentially “iffy” weather nights that could not have been used with the former hour-long setup and takedown requirements. To the South of the observing deck is the laboratory/control room. As seen below there is a computer station that is connected directly to each of the corresponding piers on the deck through conduit runs in the floor. 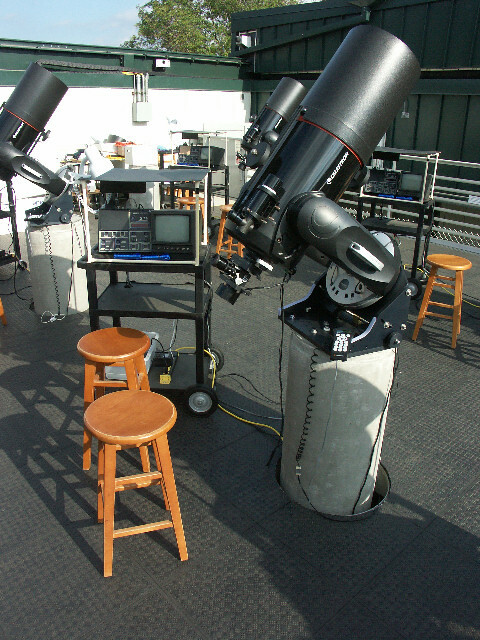 Each telescope/camera system can be pointed and controlled from the inside as well from the deck. This ability to control the telescope from the lab room also increases the number of usable observing nights. This is especially true during the winter months when crystal clear nights tend to be so cold that students cannot work outside. The lab room has a combination of white fluorescents for regular work and red fluorescents which are used to maintain dark adaptation during observing sessions. PC running TheSky6, T-Point, MaximDL, MIRA, and AstroArt software. The CPC-1100's were chosen after an initial disappointing experience with Meade LX-200 10-inch scopes that were the original choice. These were found to have numerous optical, mechanical and computer problems that remained even after they were returned to the company to be repaired. 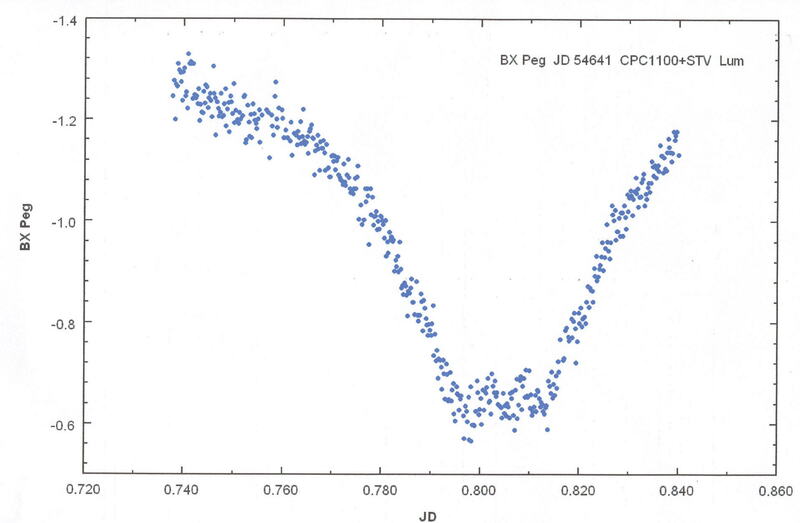 In contrast, the Celestron CPC-1100's have performed extremely well. The custom Milburn wedges have proved to be both very stable and easily adjustable. This is critical since remote operation of a telescope requires accurate pointing which in turn requires precise polar alignment as well as minimal flexure effects in the mount. 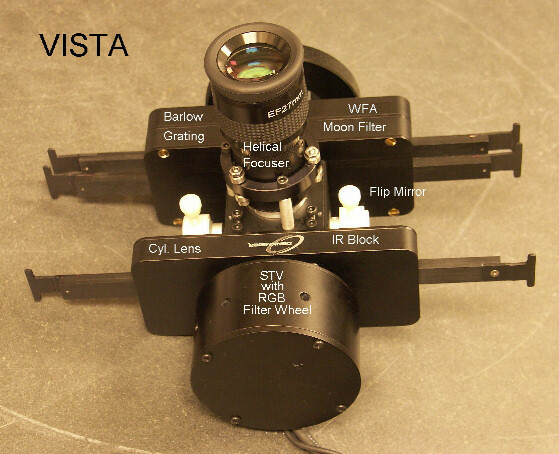 Attached to each CPC1100 is an in-house designed and fabricated instrument package we refer to as the VISTA (Visual Imaging Spectroscopic Telescope Accessory). The concept was to create an instrument package that would allow for a large number of different observing configurations without the necessity to mount and dismount instruments, something that would be an onerous task with 16 telescopes. blazed grating. 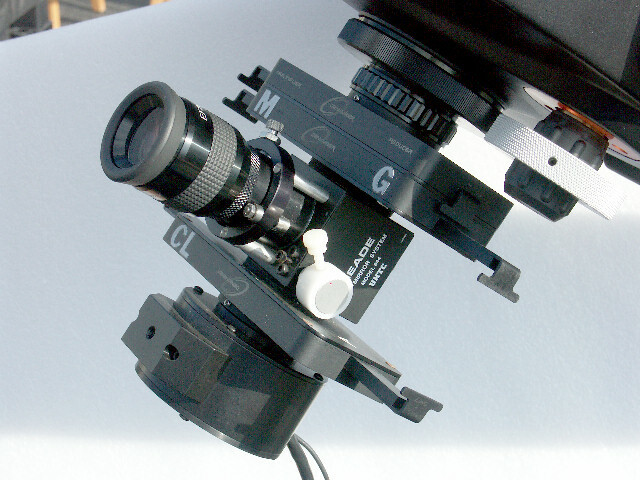 The switch behind the flip mirror contains a cylindrical lens and a currently open position (marked IR block in image). Finally, the STV itself has an internal RGB filter wheel. 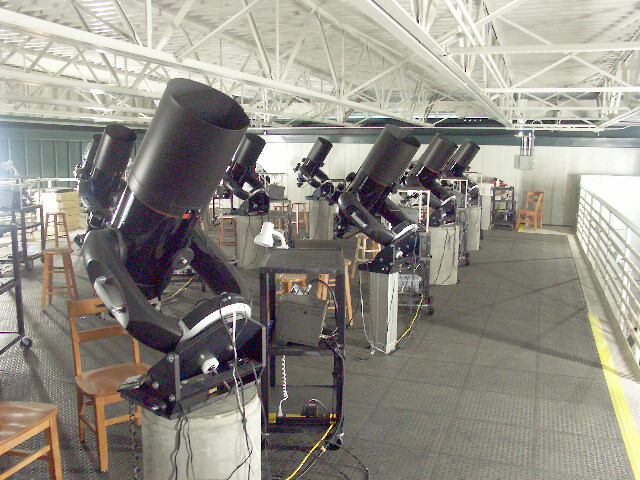 As can be seen there are a huge number of possible observing configurations although not all of them would be highly used. However, all possible combinations can be accessed by changing slider positions and/or moving the filter wheel in the STV. 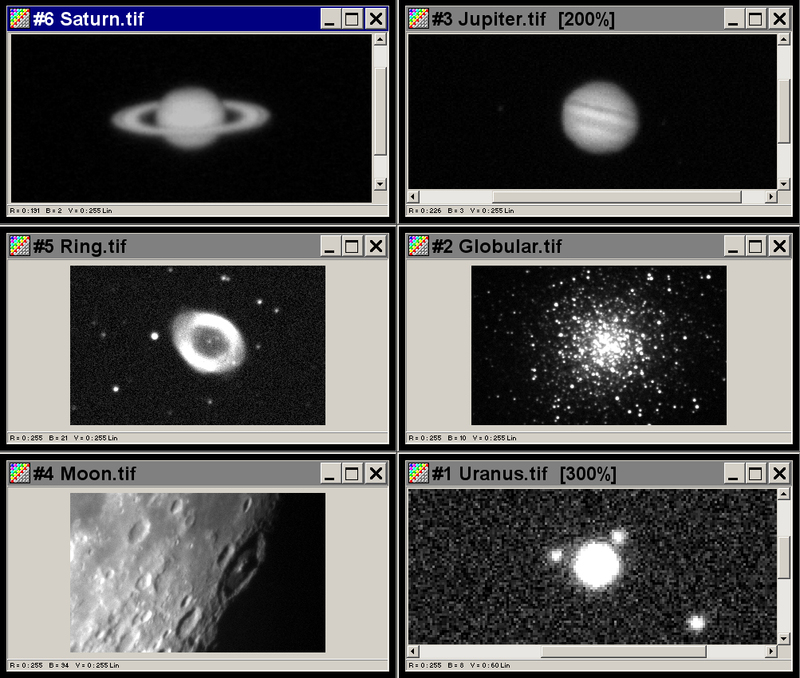 The telescope/instrument package has been designed to be very user friendly with a shallow learning curve. The STV camera is controlled (from the deck) with a simple control box rather than a complex computer program. In literally just a few minutes students and visitors who have never seen astronomical instrumentation such as this can be taking and saving astronomical images with it. 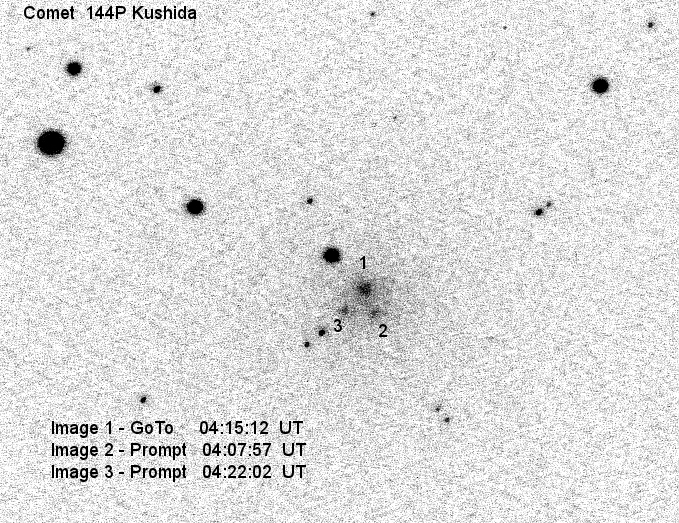 The GOTO telescopes are easily able to put any object in the field of view of the eyepiece and, when used remotely with TheSky6 and TPoint have a pointing accuracy of ~5 arc minutes which allows them to position any object of interest somewhere in the STV chips field of view. Each of the observing stations on the deck is connected to a corresponding computer workstation in the lab room. Each workstation fulfills a number of different functions. In terms of remote operation, these include telescope control through TheSky6 software package with T-Point and STV camera image acquisition and filter wheel operation with MaximDL. These two control programs are also used to control the 16" telescope used in our upper level observational astronomy courses as well as the research telescopes located at the Dark Sky observatory. 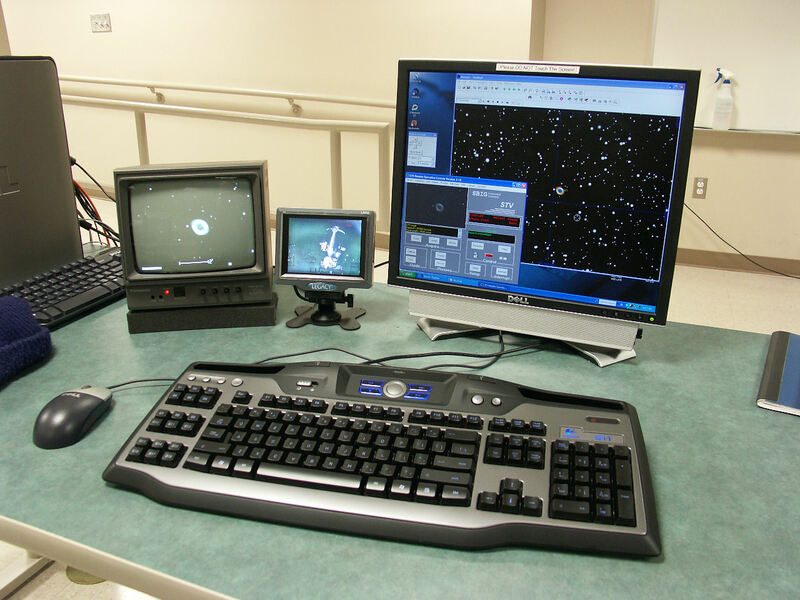 Thus, students who go through the introductory astronomy labs develop software skills that allow them to step directly into the use of the more advanced observing facilities. In addition to the computer and its associated monitor there are two additional video monitors at each lab room station. One shows the same real-time video output from the STV that is seen on the monitors upstairs. The second monitor show a real time view of each group’s telescope while they are observing. It utilizes a “baby monitor camera” with infrared illuminating LED’s mounted in such a position as to allow illumination and viewing of the telescope without causing deleterious effects on the images. This ability to actually see your telescope as it moves maintains a contact with the real world as opposed to having remote observing become something like a video game. 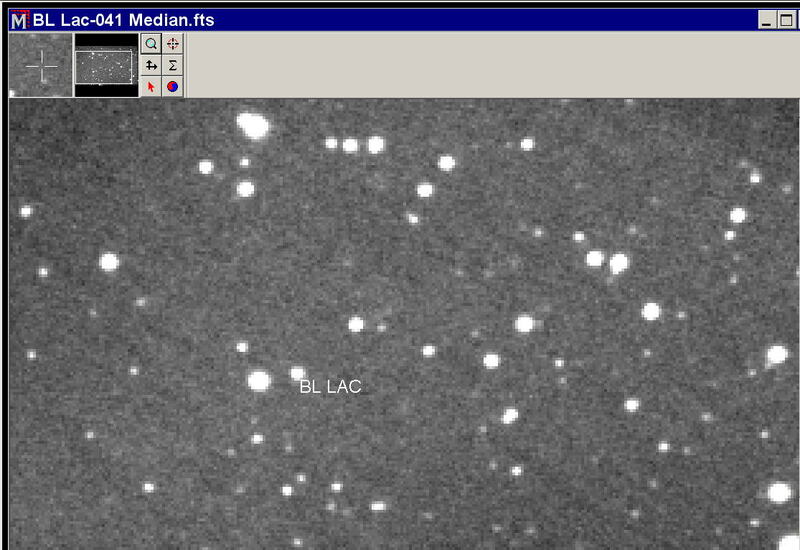 The workstations also have a variety of image analysis software on them to work with the images that have been obtained including MIRA (also used in advanced observational classes) and AstroArt. These programs are critical in the reduction of raw images and analysis of those images to produce meaningful scientific data. Finally the workstations provide a link to the web and thus access to many astronomical web sites where one can find current objects of interest to observe (new supernovae or near Earth asteroid flybys for example), simulation programs as well as many general sites of interest such as Astronomy Picture of the Day and SpaceWeather.com. They also provide access to robotic telescopes elsewhere that the students may have some access to. Essentially full operation of the facility was begun this past summer with a small number of students who were taking the first semester of the sequence. In the fall of 2008 we began operating at fully lab capacity with ten laboratory sections composed of a total of over 250 students. In addition we have run several programs for groups on campus.